Two new Pew Research Center surveys explore these issues and place them in the wider context of the tracking and profiling that occurs in commercial arenas. The surveys find that Americans feel privacy is important in their daily lives in a number of essential ways. Yet, they have a pervasive sense that they are under surveillance when in public and very few feel they have a great deal of control over the data that is collected about them and how it is used. Adding to earlier Pew Research reports that have documented low levels of trust in sectors that Americans associate with data collection and monitoring, the new findings show Americans also have exceedingly low levels of confidence in the privacy and security of the records that are maintained by a variety of institutions in the digital age. While some Americans have taken modest steps to stem the tide of data collection, few have adopted advanced privacy-enhancing measures. However, majorities of Americans expect that a wide array of organizations should have limits on the length of time that they can retain records of their activities and communications. At the same time, Americans continue to express the belief that there should be greater limits on government surveillance programs. Additionally, they say it is important to preserve the ability to be anonymous for certain online activities. Most Americans hold strong views about the importance of privacy in their everyday lives. The majority of Americans believe it is important – often “very important” – that they be able to maintain privacy and confidentiality in commonplace activities of their lives. Most strikingly, these views are especially pronounced when it comes to knowing what information about them is being collected and who is doing the collecting. These feelings also extend to their wishes that they be able to maintain privacy in their homes, at work, during social gatherings, at times when they want to be alone and when they are moving around in public. Americans say they do not wish to be observed without their approval; 88% say it is important that they not have someone watch or listen to them without their permission (67% feel this is “very important” and 20% say it is “somewhat important”). However, far fewer (63%) feel it is important to be able to “go around in public without always being identified.” Only 34% believe being able to go unnoticed in public is “very important” and 29% say it is “somewhat important” to them. In both cases, all adults, regardless of age or gender, express comparable views. The findings above come from a survey conducted Jan. 27 to Feb. 16, 2015, among 461 adults on the GfK Knowledge Panel. It has a margin of error of plus or minus 5.8 percentage points. The findings cited below in the Summary section come from a separate survey of 498 adults on the same Knowledge Panel; that survey was conducted between Aug. 5 and Sept. 2, 2014, and has a margin of error of plus or minus 5.6 percentage points. Americans have little confidence that their data will remain private and secure. For all of the 11 entities we asked about in the fall 2014 survey – from government agencies to credit card companies to social media sites – only small minorities say they are “very confident” the records maintained by these organizations will remain private and secure. Only 6% of respondents say they are “very confident” that landline telephone companies will be able to protect their data and 25% say they are “somewhat confident” that the records of their activities will remain private and secure. Credit card companies appear to instill a marginally higher level of confidence; 9% say they are “very confident” and 29% say they are “somewhat confident” their data will stay private and secure. Few feel they have “a lot” of control over how much information is collected about them in daily life and how it is used. When asked how much control they feel they have over how much information is collected about them and how it is used in their everyday lives, only a small minority of Americans say they have “a lot” of control over their personal data collection and its use. When thinking about a range of activities that might take place on a typical day, 9% say they feel they have “a lot” of control over how much information is collected about them and how it is used, while 38% say they have “some control.” Another 37% feel they have “not much control,” and 13% feel they personally have “no control at all” over the way their data is gathered and used. A very small number say they have changed their behavior to avoid being tracked recently, but many were already engaged in more common or less technical privacy-enhancing measures. Clearing cookies or browser history (59% have done this). Refusing to provide information about themselves that wasn’t relevant to a transaction (57% have done this). Using a temporary username or email address (25% have done this). Giving inaccurate or misleading information about themselves (24% have done this). Deciding not to use a website because they asked for a real name (23% have done this). Advanced measures, such as the use of proxy servers and encryption are less common. 10% of adults say they have encrypted their phone calls, text messages or email. 9% say they have used a service that allows them to browse the Web anonymously, such as a proxy server, Tor software, or a virtual personal network. Most want limits on the length of time that records of their activity can be retained. There is wide variation across the length of time that respondents feel is reasonable for businesses and other organizations to store their data. Additionally, there is considerable variance on their views depending on the kind of organization that retains the records of the activity. In general, and even though it may be necessary to provide certain functionality, people are less comfortable with online service providers – such as search engine providers and social media sites – storing records and archives of their activity. 50% of adults think that online advertisers who place ads on the websites they visit should not save records or archives of their activity for any length of time. 44% feel that the online video sites they use shouldn’t retain records of their activity. 40% think that their search engine provider shouldn’t retain information about their activity. 40% think that social media sites they use shouldn’t save data about their activity. 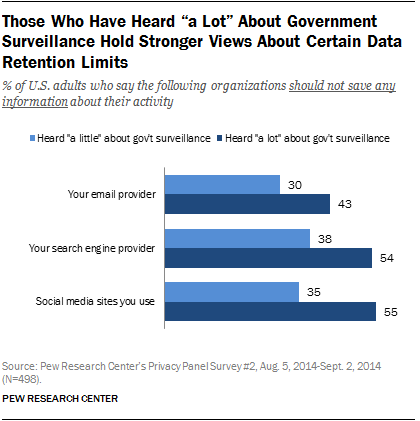 Those who have had the most exposure to information about the government surveillance programs also have some of the strongest views about data retention limits for certain kinds of organizations. These differences are particularly notable when considering social media sites. Among those who have heard “a lot” about the government collecting communications data as part of anti-terrorism efforts, 55% say that the social media sites they use should not save any information regarding their activity, compared with 35% of those who have heard “a little” about the government monitoring programs. When asked to think about the data the government collects as part of anti-terrorism efforts, 65% of Americans say there are not adequate limits on “what telephone and internet data the government can collect.”1 Just 31% say they believe that there are adequate limits on the kinds of data gathered for these programs. The majority view that there are not sufficient limits on what data the government gathers is consistent across all demographic groups. Those who are more aware of the government surveillance efforts are considerably more likely to believe there are not adequate safeguards in place; 74% of those who have heard “a lot” about the programs say that there are not adequate limits, compared with 62% who have heard only “a little” about the monitoring programs. 55% of Americans support the idea of online anonymity for certain activities, but many are undecided on the issue. In the current survey, the majority of adults (55%) said that people should have the ability to use the internet completely anonymously for certain kinds of online activities. Another 16% do not think people should be able to remain anonymous when they are online; 27% said they don’t know. Men are more likely than women to think people should be able to engage in certain online activities anonymously (61% vs. 49%), but support for internet anonymity does not vary by age. Education is a predictor, but income is not; adults with at least some college education are significantly more likely than those who have not attended college to believe that people should have the ability to use the internet anonymously (66% vs. 40%). Even as they expect online anonymity, most assume that motivated people and organizations could uncover private details. Many believe they are particularly vulnerable to people or organizations who have a motive to learn private details about their past. When considering how difficult it would be for a motivated person or organization to learn private details about their past that they would prefer to keep private, 64% of adults said it would be “not too” or “not at all” difficult for a motivated person or organization to uncover that sensitive information. Just 20% felt it would be “very” or “somewhat” difficult. Men and women report similar responses, but those ages 50 and older (76%) are significantly more likely to believe it would be “not too” or “not at all difficult” when compared with those under the age of 50 (54%). Similarly, those with a college degree are more likely than those who have not attended college to feel more exposed (70% vs. 58%). The majority of the analysis in this report is based on a Pew Research Center survey conducted between Aug. 5, 2014, and Sept. 2, 2014, among a sample of 498 adults ages 18 or older. The survey was conducted by the GfK Group using KnowledgePanel, its nationally representative online research panel. GfK selected a representative sample of 1,537 English-speaking panelists to invite to join the subpanel and take the first survey in January 2014. Of the 935 panelists who responded to the invitation (60.8%), 607 agreed to join the subpanel and subsequently completed the first survey (64.9%), the results of which were reported in November 2014. This group has agreed to take four online surveys about “current issues, some of which relate to technology” over the course of a year and possibly participate in one or more 45- to 60-minute online focus group chat sessions. For the second survey whose results are reported here, 498 of the original 607 panelists participated. A random subset of the subpanel is occasionally invited to participate in online focus groups. For this report, a total of 26 panelists participated in one of three online focus groups conducted during December 2014. Sampling error for the total sample of 498 respondents is plus or minus 5.6 percentage points at the 95% level of confidence. An additional survey related to Americans’ views about the importance of privacy was conducted between Jan. 27 and Feb. 16, 2015, among a sample of 461 adults ages 18 or older. The sample was drawn from the same 607 adults who agreed to participate in the subpanel on privacy. It has a margin of error of plus or minus 5.8 percentage points. For more information on the Privacy Panel, please see the Methods section at the end of this report. The authors would like to acknowledge the generous contributions of the various outside reviewers who offered their insights at various stages of this project. In particular, we would like to thank Tiffany Barrett, danah boyd, Mary Culnan and all of the attendees of the Future of Privacy Forum Research Seminar Series, Urs Gasser, Chris Hoofnagle, Michael Kaiser, Kirsten Martin and Bruce Schneier. In addition, the authors are grateful for the ongoing editorial, methodological and production-related support provided by the staff of the Pew Research Center.